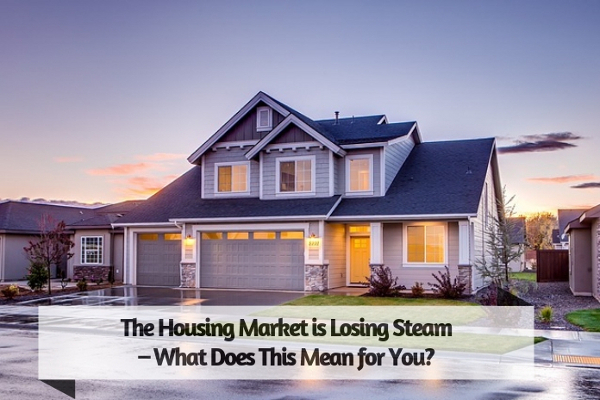 Home / real-estate / The Housing Market is Losing Steam – What Does This Mean for You? The Housing Market is Losing Steam – What Does This Mean for You? It’s not a secret that the US housing market has been hot for some time. House prices have been steadily rising, creating a great market for sellers (and a tough market for would-be buyers.) It’s hard for many to imagine the momentum slowing any time soon. Despite the trend of rising home values and seller’s markets, Americans know from experience that real estate values can and do sometimes fall dramatically (case in point, the burst of the housing bubble in 2007). And now, reports are hitting the news about a potential market slow down. So, what does this mean to you if you’re selling a home, shopping for a home, or looking to invest in real estate? Are we in a bubble now? Can what happened in ‘07 happen again? Let’s break it down. As of today, the housing market is still strong across most of the country. Although pricey coastal cities might be seeing a bit of a contraction, some less expensive midwestern cities are seeing incredible growth - consider the strong markets and affordable inventory in cities like Columbus, Ohio, St. Paul, Minnesota, or Racine, Wisconsin. Even in pricey coastal cities, there are still more buyers than there are homes for sale – or, perhaps more precisely, more buyers than there are affordable homes for sale. The strong market we’re seeing is the result of prices bouncing back from 2007’s bursting bubble. Prior to 2007, a perfect storm of events led to exploding property values and less oversight on who was able to take out a mortgage loan. As such, more and more people were able to buy homes. Many of these people were considered “sub-prime” borrowers, or borrowers with poor credit or no savings. Many of these sub-prime mortgages also required very little down and very little documentation, making it easy to get into a home. In addition, adjustable rate mortgages (ARMs) that looked like a fine idea on paper turned out to not be a fine idea when interest rates (and, therefore, monthly mortgage payments) rose. In addition to sub-prime lending, many other people who were already homeowners saw their skyrocketing home value as an ATM, borrowing against the equity and using the cash for discretionary spending. In all, trillions of dollars were lent to borrowers, and many of these borrowers quickly went into default on their loans. Large banks that had underwritten and now held many of these bad mortgages started to falter; housing prices began to fall. Soon, many homeowners found themselves “underwater” in homes that were no longer worth anything near what they had been mortgaged for. Bailouts kept the economy from collapsing completely, but the growing bubble had burst. Home prices bottomed out in 2009 and slowly corrected. Now, in 2018, median home prices are still 7.5% lower than they were at the bubble’s peak in 2006. Lenders stopped giving out ARMS with extremely high caps and borrowers with bad credit or no savings were locked out of the market; the shadowy no-documentation loans became largely a thing of the past. Where is The Market Today? With the housing market as strong as it is today, some wonder if we might soon see a downturn. The good news is that, even if the market does slow, it’s unlikely it will be anywhere near as devastating as the 2007 - 2008 crash. Banks are more careful about lending to sub-prime borrowers and borrowers are more in-tune to the reality of ARMs. That being said, many economists do think the market is cooling, for a number of reasons. One of the drivers behind this slowdown is that the average home price has increased much faster than the average income. This is especially apparent in high-cost-of-living metro areas like San Jose, where the average person would need to make an annual income of $274,623 to enter the housing market. These high housing prices, combined with fierce competition and bidding wars for entry-level homes, mean many would-be first-time buyers simply decide to give up on hunting. Interest rates are also up — to the highest level in eight years, in fact. Higher interest rates mean buyers can only afford small houses for their money, driving some buyers to hold off. What Does the Cooldown Mean if You’re Looking to Buy or Sell? Whether or not this is a good time to buy will depend on your reasons for wanting to do so. If you’re seeking investment properties, then the short answer is no. Higher interest rates and rising property values mean you may end up taking a hit if values decrease. Also, it might not be an appropriate time to buy if you intend to “flip” the property. Flipping is only successful if you buy low and sell high. The current market makes that outcome questionable. If you are looking for a home to call your primary residence, it’s probably still safe to buy. Chances are, at least for a while, property values will continue to climb (albeit more slowly than they have been). Interest rates are also certain to go up, too. If you’re looking to sell a home, now is a smart time to do it. Property values are still high and it’s a good idea to sell before interest rates climb. Even if the market has slowed, it’s still decidedly a seller’s market in most places. This means you can get full value for your home and generally, sell it quickly. In short, experts and economists agree that yes, the housing market is losing a bit of steam. However, unless you’re looking to enter the market now as an investor or house flipper, it’s unlikely to affect most people – at least not eminently. If shopping, keep shopping. Do your homework. Know what you can afford to spend and don’t go over that number. Avoid becoming emotionally attached to a home before it’s yours. If you follow these simple rules, you should be safe entering the market now. If looking to sell, now is the time. You can probably still get your full asking price for your home. Thanks to policy changes made after the crash of 2007, it’s likely that today’s cooling market will make a softer landing this time around.